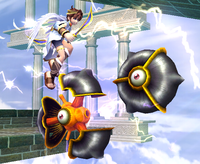 The Glunder (ガルサンダー, Galthunder) is an enemy in Super Smash Bros. Brawl's Subspace Emissary mode and Super Smash Bros. for Nintendo 3DS's Smash Run mode. Glunders debuted in Brawl's Subspace Emissary. They look like black tires that roll along floors, walls, and ceilings (however, they never stop rolling if left alone, which often kills them during locked battles). If a Smasher is close by, a Glunder will stand still, open up, and release a flash of electricity. The attack hits several times and is difficult to escape; the last hit has decent knockback. Like electric Jyks, Glunders only appear in levels located in the sky. An enemy that separates into three parts, then blasts enemies with a high-tension current it produces within its body. When it's ready to attack, it will make a "Bzzt!" sound and produce a lightning flash. When this happens, approach with caution. This enemy type is color coded--Glires are red, Glices are blue, and Glunders are yellow. It's a family of destruction! Glunders reappear as enemies, keeping their Brawl behavior. They are bigger, but deal less damage. Compared to their counterparts, Glices and Glires, they are faster and lack elemental weaknesses. This rotating enemy likes to follow the terrain. The yellow one is called Glunder. Whenever a fighter gets too close, it'll release a blast of lightning. One hit isn't too bad, but taking several will really leave you hurting. Best to try to take this thing out from a safe distance. If one of these rolling enemies gets close to you, it'll stop, open its outer shell and zap you. Individual shocks don't hurt much, but they add up. Glunders also have a wider attack range than Glices and Glires, making them very dangerous. Since they don't have any elemental weaknesses, just stand back and hit them with any old projectile. Glunder's name is a combination of the words glare, referring to its eyes on either side of its body that are wide open, and thunder, referring to its electric attack. This page was last edited on January 23, 2019, at 01:05.